Oball has done it again. Oball's unique designs are easy for little hands to grasp and explore, and now baby has an entire gym full of Oball activities to choose from. The Oball play-o-lot activity gym is full of engaging shapes, dynamic colors and tactile activities that will keep your baby happy and entertained for hours. The electronic lion toy offers blinking lights and 8 playful melodies that are baby-motion activated or can play continuously for 20 plus minutes. The soft prop pillow offers baby the perfect amount of support during tummy time. Other fun toys include our famous Oball classic, the clickity twist, a baby-safe mirror, 3 linky loops teethers and 8 Oball links for adding additional toys. 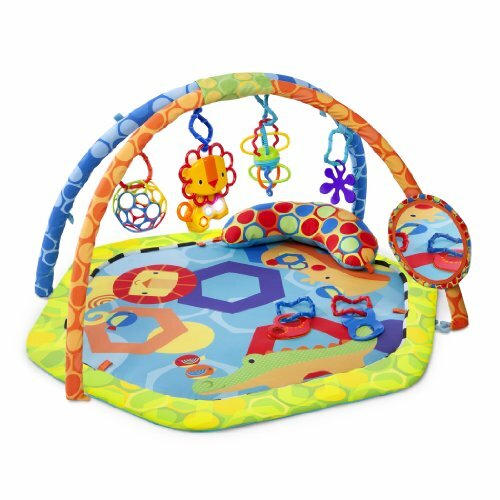 The brightly colored play mat is machine-washable. If you have any questions about this product by Oball, contact us by completing and submitting the form below. If you are looking for a specif part number, please include it with your message. Kutchu Children's Play Mat - The only play mat made of natural rubber. Safe, non-toxic, eco-friendly.